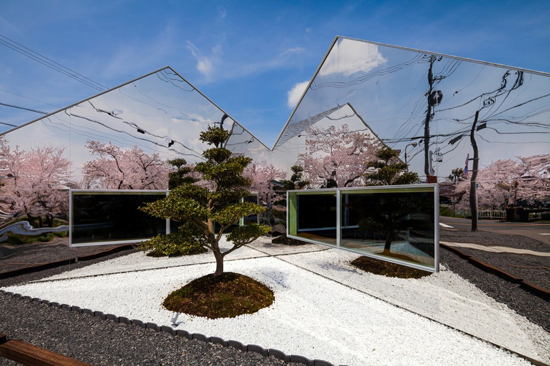 Appropriately named Mirrors, this striking cafe features wall-length mirrors on its exterior, reflecting the famous Cherry Blossom trees opposite. Designed by Bandesign, the coffee house is located along one of Japan's tourist routes in Gifu - a sure-fire way of welcoming travellers inside. Camellia trees sit out the front surrounded by ivory gravel, while the remainder of the building is painted white for a traditional clapboard effect. 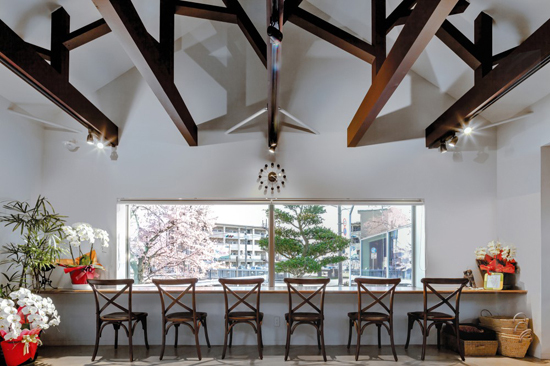 Bandesign have perfectly balanced the aesthetics with this coffee house, allowing the main focus to speak for itself. The interior of Mirrors, displaying wooden accents for the forest theme. The interior incorporates roof struts of dark wood to resemble tree branches, with wooden chairs and white, green and red walls - all supporting the forest theme. View of the cafe from across the avenue on the embankment, where the Cherry Blossoms were planted. What do we love about it? 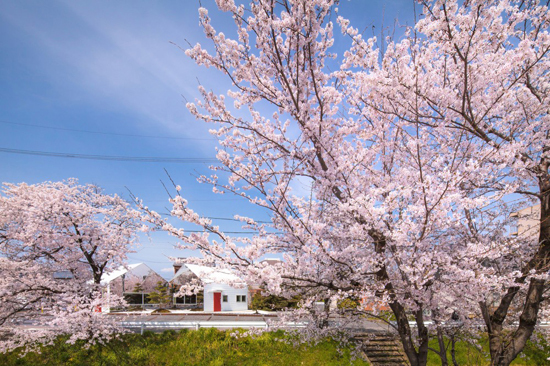 A definite destination during your visit, the Cherry Blossom season is a beautiful yet fleeting occasion. To ensure customers can enjoy the cafe's beauty throughout the year, Bandesign planted the Camellia trees, which bloom vivid red flowers during the months of winter and spring, providing a seasonal colour scheme.